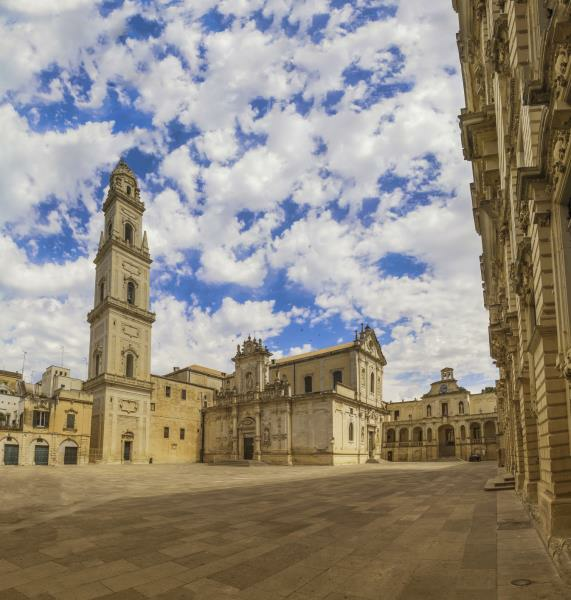 It is difficult to describe Lecce, as anyone who has visited knows. It is a surprising city, with evocative Baroque architecture that has a rich and creative beauty that overflows from the many churches, extraordinary buildings, cornices and balconies that crown the alleyways in the historic center. Lecce stone, the master of building materials in the historic center, has a warm, pleasant and relaxing color that fills the entire city with a tranquil light. Lecce is also small, welcoming, easygoing and pleasant due to its mild weather for most months of the year. It is the center of Salento, a region surrounded by two seas, the Adriatic and Ionian, that offers many gems - among the best known being Otranto and Gallipoli. The territory of Salento is home to many traditions and events - such as the many festivals and religious pageants (there are many during the summer months) - and the many exquisite foods. Lecce and its surrounding region offer natural landscapes, comprising stretches of olive trees and vineyards. Mediterranean scrub sprouts here and there, adding color and fragrance to the countryside. The coast, scattered with lighthouses, is comprised of alternating sandy and rocky coastline that leads to a glittering, glorious sea. The coastal lagoon, as in the Le Cesine nature reserve and the Alimini lakes, host many species of migrating birds.